Benson Group, a leading UK manufacturer of printed cardboard packaging, has announced the launch of a full range of microwave cooking solutions. Part of the range was deliciously demonstrated on-stand at Packaging Innovations in Islington back in October, with bacon roll snacks being prepared and enjoyed by visitors. The availability of this collection of microwave cooking solutions is a significant collaboration with parent company, Graphic Packaging International. “The microwave cooking solutions now available to Benson Group are products already commercially available in the US and combine a number of market-leading technologies. This includes the use of materials that have the ability to focus microwave energy exactly where it’s needed in order to deliver consistent, even heating, steaming or browning and crisping of food,” added Dr Roberts. 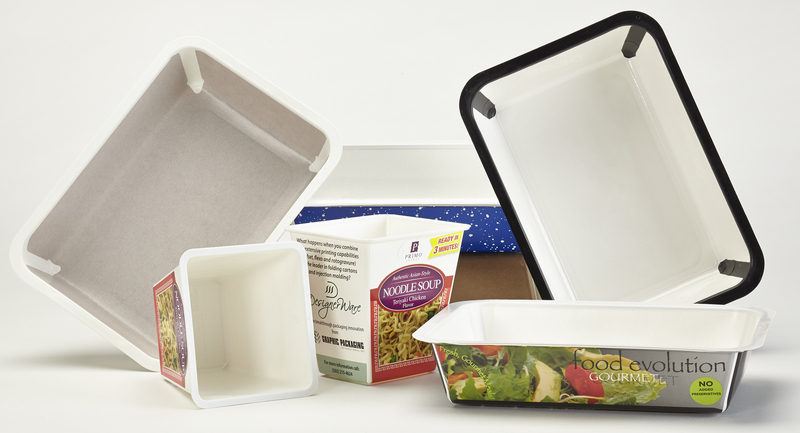 DesignerWare® demonstrates a breakthrough in sustainable packaging. The finished product combines paperboard and plastic for exceptional barrier protection with unsurpassed microwave performance. DesignerWare® can be printed to maximise graphics and text areas and is available in a range of profile shapes and sizes. MicroFlex-Q® is a flexible packaging film for browning and crisping food products. It can be used in carton format via patch application. MicroFlex-Q® is printable and is both moisture and grease resistant. Quilt Wave® is a microwave technology designed to be used with irregularly shaped food products. Quilt Wave® has been engineered with cells known as “quilts” that expand when exposed to microwaves, this drives away moisture and allows maximum browning and crisping. Qwik Crisp® is a solution that can be modified on a bespoke basis depending on the product. It works using unique susceptor patterns designed to unique specification. Qwik Crisp® can be used in a number of formats including cartons and trays. It is ideal where browning and crisping of dough based products, such as bread and pizza, is required. Focus Inset Carton® is a traditional folding carton with a twist. It includes a microwave susceptor pattern that is applied during the manufacturing process. Focus Inset Carton® eliminates the need for secondary packaging elements and provides the capability to brown and crisp food. MicroRite® is the ultimate in convenience for customers, using susceptor technology MicroRite® manages the microwave energy during the cooking process which reduces loss of moisture from product. The result is oven quality food from the microwave. Benson Group, now part of Graphic Packaging International, is one of the UK’s leading printed folding carton suppliers, producing packaging product for the food retail industry for a wide range of UK and European customers. The business is expecting to achieve sales of in excess of £100 million in the coming year. The company manufactures packaging product at three production sites covering in excess of 300,000 square feet. Food and beverage processors are the main customers for the three production sites, with UK headquarters and manufacturing at Bardon, Leicestershire, and further production facilities at two sites in the North East, at Gateshead and Newcastle. The group employs over 800 UK based employees. In recent years, investment in new plant and equipment across the three sites totals in excess of £20 million including the purchase of an eight-colour Heidelberg Speedmaster XL 106 B1 format perfecting press. Benson Group creates packaging for many well-known companies, brands and retailers. Key account clients across the Group include Two Sisters Food Group, Greencore, and Samworth Brothers. The company is an approved supplier for all of the UK’s leading retail chains. For further information on the Benson Group visit the www.bensongroup.co.uk web site. 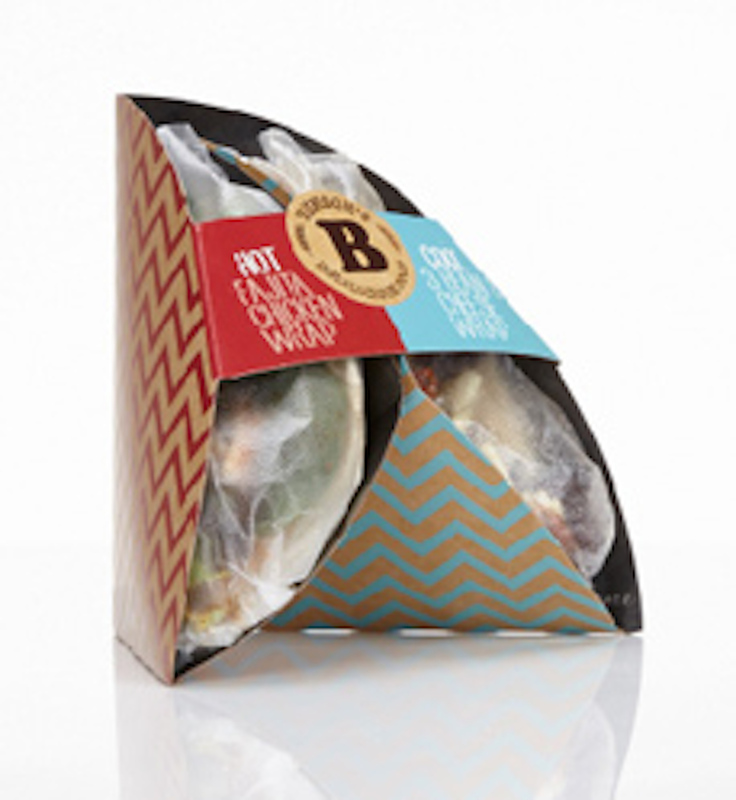 Benson Group, one of the UK’s leading printed folding carton suppliers, is celebrating its win in the Best New Concept category of the 2014 UK Packaging Awards, as staged by Packaging News magazine. The winner, Benson Delilicious Quesadilla, is a new Mexican-style stuffed tortilla wrap packaging and was exhibited at the recent Packaging Innovation show in London. It forms a part a highly innovative Food to Go range called Delilicious, developed by Benson Group. Commenting on the win, Benson Group’s Helene Roberts said: “We’re overjoyed to have been awarded the prize by the judges of the UK Packaging Awards within the Best New Concept category, especially in amongst such tough competition. It is testament to the ongoing commitment of Benson Group’s Marketing and Design teams to develop packaging solutions that will meet the needs of consumers and satisfy future market trends.” The shortlist for the award included entries from Ardagh Group and Reckitt Benckiser. The award illustrates the importance of providing design teams with the freedom to examine new concepts. “Both time and resources are needed within design departments in order to tap into the creative capabilities of the team,” added Helene Roberts. Helene also highlighted the pride in the company for colleague Lauren Hutchinson, who was shortlisted in the Rising Star Award section. Benson Group, now part of Graphic Packaging International, is one of the UK’s leading printed folding carton suppliers, producing packaging product for the food retail industry for a wide range of UK & European customers. The business is expecting to achieve sales of in excess of £100 million in the coming year. The company manufactures packaging product at three production sites covering in excess of 300,000 square feet. Food and beverage processors are the main customers for the three production sites, with UK headquarters and manufacturing at Bardon, Leicestershire, and further production facilities at two sites in the North East, at Gateshead and Newcastle. The group employs over 800 UK based employees. In recent years, investment in new plant and equipment across the three sites totals in excess of £20 million including the purchase of an eight-colour Heidelberg Speedmaster XL 106 B1-format perfecting press. Gloucester-based print and digital media house, Severn, has turned to Prepress UK in order to keep its Kodak Prinergy driven Epson large format printers producing ISO12647-2 certified proofs. The single StudioRIP Inkjet Edition software package is driving two Epson 7800 printers – and producing proofs at twice the speed of the original system. Some two years ago, Kodak, suppliers of hundreds-of-thousands of pounds worth of pre-press equipment to Severn, including its Prinergy workflow system, had advised the customer that it would no longer be supporting the Epson printer connection that it had originally provided. All continued well for a time, but when difficulties arose with the system, Production Manager Lyndon Murray (pictured above) had to act quickly. “I had known Nic Chapman [Prepress UK Sales Director] for many years, and approached him to ask if he would be able to help us in our “hour of need”,” said Lyndon. 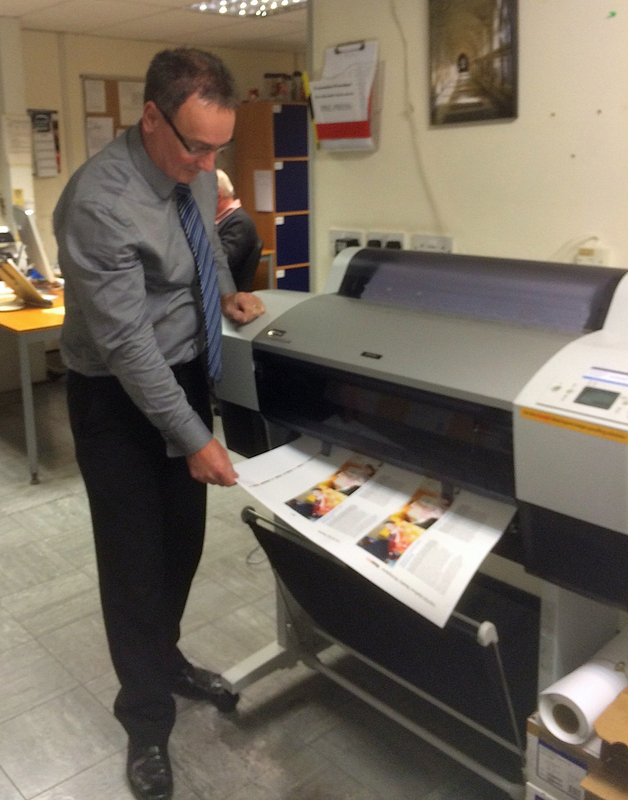 “I was amazed at how quickly Prepress UK were able to come to the rescue. From my initial contact with Nic, we had the solution installed and working within four days. Severn hit the headlines earlier this year when the environmentally friendly print business installed one of Komori’s first B2 format H-UV presses, providing fast and efficient UV drying. Severn was established in 1977. The company has developed print related services to match exactly what its customers require and all are delivered using Severn’s environmental expertise. The business offers traditional printing, but with its latest investment, the Komori H-UV press, a fast drying, “better-for-the-environment” offset litho solution; personalised printing with the latest digital output; display printing for big impact poster sized work; design and artwork for print as well as on-line needs; mailing; as well as a full cross media solution bringing digital and on-line together. The directors of Severn realised many years ago that printing is one of the few industries that has the potential to be truly sustainable in its purest form. The company has been working with its environmentally supportive customers to achieve this goal of providing a truly sustainable business. Severn was at the forefront of reducing IPA (industrial alcohol used by litho presses to break down water surface tension) to levels way below that used by many UK printers. Now it has eliminated the use of IPA entirely, and has become an alcohol free printer. The firm attained the ISO 14001 accreditation and FSC certification in 2004, and last year it became one of nine printing companies in the UK to meet the European Eco-Management and Audit Scheme’s environmental standards.